Do you have a health and wealth roadmap? Do you have a roadmap to a healthier and more secure future? In a busy life it’s hard to know what next week will bring, much less next year or the next decade. But having a roadmap that focuses on both health and financial security through every stage of your family’s life is an important tool that can help you stay on track and achieve your goals. To help you build that plan, PinnacleCare, in partnership with global financial services provider Northern Trust, has developed a health and wealth roadmap. 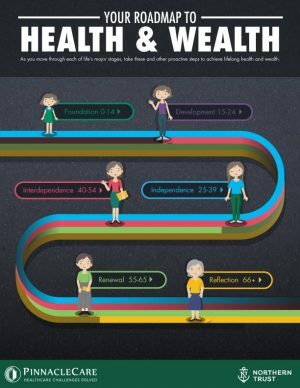 This roadmap provides the key factors you should incorporate into your plan at every stage of life, from health screenings, prevention strategies, and healthy lifestyle choices to money management, investment strategies, and retirement planning.